Liquidating the belongings of a family or estate is one of our strong suits. Whether you’ve been left an estate after the passing of a loved one or you’re moving and just can’t take it all with you, we have the experience and skills necessary in order to liquidate your belongings with care and ease. Want to sell items due to downsizing, moving, divorce, bankruptcy, or death? Regardless of the reason for wanting to have an Estate Sale, know that we are ready to help you. Getting rid of sentimental items and/or unwanted belongings might just be the key to living a more balanced and organized life. Estate sales are a great service for people who must sell a lifetime of belongings due to a move or a death in the family. If you’ve ever faced having to sell a home and move, you know how time consuming the process can be. In the event of a loved one’s passing, getting rid of their belongings and personal possessions is never easy. Estate sales are not only a great way to earn some additional income, but it can allow you to free yourself both physically and mentally from personal possessions. 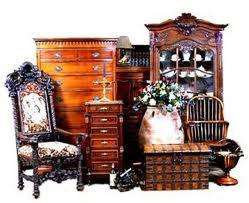 We have a full service Estate Sale business to help you “turn your treasures into cash.” We can help organize and host an estate sale from start to finish. With thorough planning and organization, we can help you earn some additional income. We will organize, set up, and price your items for the Estate Sale. We have extensive knowledge in antiques, art, vintage jewelry, crystal, china, silver, and more and we will price your items accordingly. Let us take care of your estate sale and free yourself from the stress, time and energy of having to undertake the process on your own. Call us at (310) 560-5060 to find out more about how we can help organize your estate sale. Having an organized office can do wonders to your productivity and work performance. Ensuring your office is physically organized and clutter-free can allow you to focus your time on completing tasks that are important rather than spending essential time looking for items and files. Office organization is IMPERATIVE and will help on so many different levels: financially, physically, and emotionally. If you look around and are overwhelmed with the amount of clutter, including unfiled papers and disorganized desks, then it’s already evident that you need to put some measures into place to organize effectively. Disorganization can take a toll on various aspects of your life including your mental health as well as the success of your business. Therefore, it’s important that you take care of the problem before it becomes more difficult to manage. Increase efficiency and productivity by organizing your office. Once you’ve implemented proper storage and organization techniques, you’ll feel much better about the space you’re working in. Additionally, your time management skills and your productivity will be positively impacted. Get more done in less time. Once your office is adequately organized, you’ll notice that completing tasks will become a lot easier. The things that once took hours to get done may take a lot less time because you know where to find the things you need and you’ve got a clear work area to carry out your operations effectively and efficiently. Get your office organized with our effective systems. Uncertain about what measures need to be put into place in order to increase your productivity? That’s where we come in! We can implement systems and strategies uniquely tailored to your needs to get you organized and help you stay organized. We can put systems into place which can be easily maintained. 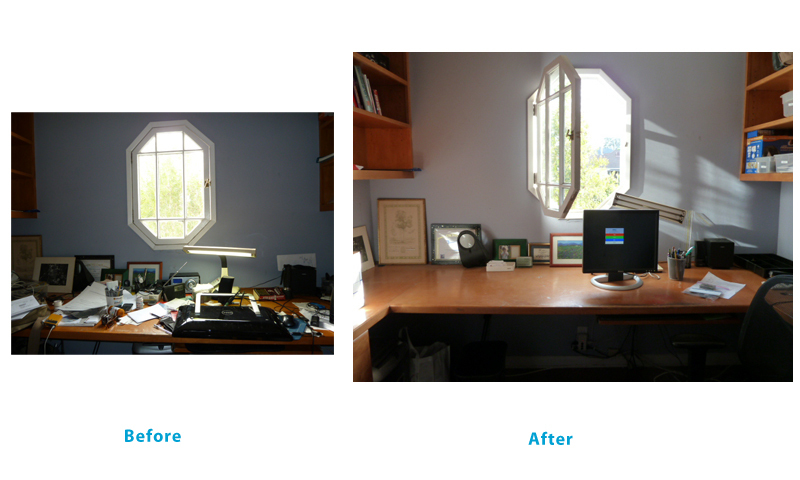 For many people, maintaining the organization and clutter-free environment is a challenge. We can help you develop a system that makes it exceptionally easy to keep your office organized. Call us at (310) 560-5060 to get more information on how we can help you effectively organize your office space. Many of us are guilty of holding on to personal possessions that merely take up space and add clutter. We often accumulate items which we are emotionally attached to and before we know it, our space is messy and cluttered. The fear of letting go of certain sentimental items may be too difficult for some people to bear. However, know that there’s help available and steps you can take in order to maximize your space and get over your uncluttering fears. If you don’t need it, let it go. Taking the time to sort through your items can help you determine whether your sentimental possessions are truly worth keeping. People often hold on to these personal possessions because there’s an emotional attachment to them; whether a memory of a loved one or a past experience they want to hold on to. Although it may initially be difficult to let go of these items you have kept for so long, letting go will help you finally simplify your space and benefit from an organized lifestyle. Make room in your life by getting rid of things you no longer need. Donating or tossing items you no longer need can allow you to declutter your space. By doing so, you can make room for new items that are useful and essential to your life. Best of all, you can finally find what you’re looking for with more ease without having to look through piles of mess. Letting go of physical possessions is necessary at times. Take a moment and ask yourself if you really need the item, and if you don’t, then perhaps it’s time to let it go. Recognize that these personal possessions may be weighing you down and letting them go can free you from the attachment you’ve placed on them. I can help people determine what to keep, what to toss, and what to donate. Sorting through all your items may be overwhelming and difficult at times. We can help you get started on your path to organizing and decluttering your space. Through years of experience, we have the expertise to help you categorize which items are important to keep and which ones are worth donating. Together we can work to eliminate the clutter in your home and help you simplify your life. I can offer helpful advice on what to do with the items you want to keep. We can provide you with sound advice on how you can store your belongings so they that they don’t accumulate and become clutter in your home or office. Call us at (310) 560-5060 to schedule a consultation so we can get started on eliminating the clutter in your life. For more tips on getting organized, like our Facebook page. Discard items you don’t want or need and get a tax deduction in the process. Although storing away old clothes in boxes and hiding them in the basement or the attic is always an option, getting rid of them in the first place is much easier. Sorting through all of your clothes and separating them into new and unwanted clothes can simplify the de-cluttering process by helping you quickly decide which clothes should stay and which ones are good to go. As an additional benefit, you can claim tax benefits when you de-clutter your closet. Donating your clothes to charities not only maximizes your closet space but benefits you when tax season comes around. Stay organized to prevent clutter from accumulating in your closet. We often buy more clothes than we get rid of, and before we know it, our closet has become cluttered; making it difficult for us to quickly find what we’re looking for. To ensure your closet stays organized, it’s important to neatly categorize similar clothing items together (e.g., pants, tops, dresses). Another helpful strategy is to use organizing tools which can maximize your closet space. Open up space for the things that you need, want, and use by getting rid of old belongings. Out with the old, in with the new. Many of us hold on to old clothing items in the hopes that they may come in handy someday. The same goes with clothes that no longer fit. Some people hold on to these items thinking that one day the clothes will once again fit. If your clothing items are too big or small on you and aren’t in great condition, it’s advised that you donate these items and make room for new clothes that you’ll enjoy wearing. Don’t let unused items take up space; take advantage of the room you have by keeping items you’ll actually use. We have a list of charities to donate your specific items to. Donating clothes to charities help you get rid of unwanted clothes and also allows you to help those in need. Simply give us a call and we can help provide you with a list of charities that will accept your donations. You can do something positive for your community and your home at the same time. We can facilitate donations by either dropping them off or scheduling a pick-up directly at your home. Not sure how the donation process works? 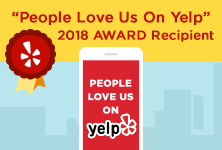 We can help guide you through the process. Certain charities such as The Salvation Army will pick up donation items directly from your front door. We help make the donation process simple for you so you can focus on cleaning and maintaining an organized closet. 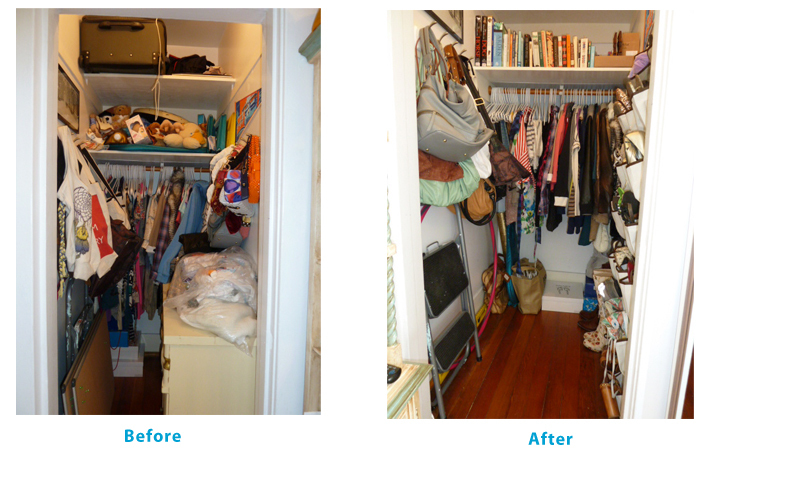 Call us at (310) 560-5060 to get help with de-cluttering your closet and don’t forget to like us on Facebook!